Gnomes are a bit of a gardening joke aren’t they? Despite that they live on in small pockets of the nation. There are Gnome reserves all over the northern hemisphere, and like Marmite I guess you either love them or hate them. Like the Christmas tree and the greeting card, Garden Gnomes were brought into Britain from Germany. Not by Prince Albert in this instance but by a baronet, Sir Charles Edmund Isham, after seeing terracotta Gnomes there on a trip in 1847. The Gnomes were proudly displayed by Sir Charles in the grounds of his family home, Lamport Hall in Northamptonshire. His family were less keen on them, and had them removed. However one of the original Gnomes, called ‘Lampy’ still survives, (presumably he hid in the woods when the cull happened) and is now so cherished by the estate that he has been insured for £1 million. Gnomes are a mythical race, said to live underground and guard hordes of treasure. Perhaps it is this link to treasure that accounts for their enduring appeal. 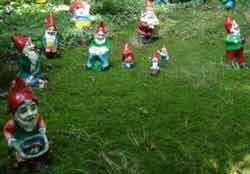 It is also said that Gnomes become active at night and like to help out in the garden. Who wouldn’t want a family of little helpers to help with weeding and slug control? Historical reports from Germany note that they were often placed in barns as a talisman, to ‘look after the livestock’. Like many things that were started by the aristocracy and subsequently become adopted by the masses, Gnomes have been regarded as tacky by the gardening cognoscenti for years. However this year marks a Gnomic shift as the Chelsea Flower Show have decided to lift a 100 year ban on Garden Gnomes in show gardens this year. The Gnome ban has been lifted to allow a Celebrities to decorate Gnomes and auction them as a fundraiser on behalf of the RHS. Funds will be used to encourage schoolchildren to get involved in gardening to promoter the idea of a career in horticulture. Elton John is reported to have created a bling Gnome with trademark glasses for his contribution to the event. Celebrity Gnomes aside it will be a brave exhibitor that uses Gnomes – they will have to come up with something pretty spectacular in order to beat Gnome prejudice and bag a medal. If you are a Gnome fan, or have ideas for modernising the Gnome do share your ideas with us on twitter, Facebook or Pinterest. How do you pick your tools?